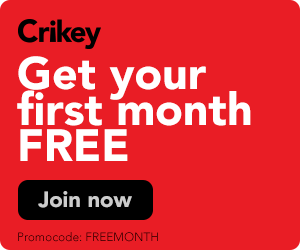 Sometimes there's a real stand-out in the media for truly terrible journalism, and Crikey likes to acknowledge the effort that goes into these with a coveted Wankley Award. Today we're giving one to The Daily Telegraph for an over-the-top beat-up about a defence force training document. Sometimes there’s a real stand-out in the media for truly terrible journalism, and Crikey likes to acknowledge the effort that goes into these with the coveted Wankley Award. And, despite others in the News Corp empire doing their best for the honour, we’re giving one to The Daily Telegraph for an over-the-top beat-up about a defence force training document. 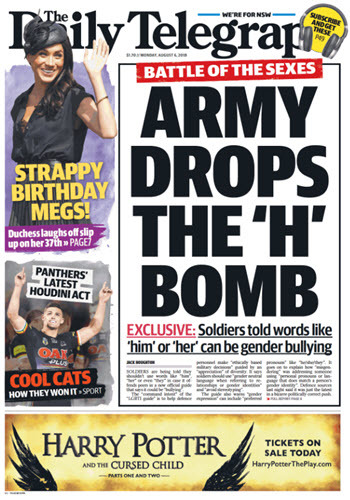 The Tele‘s Monday front page is dedicated to an “exclusive” report about a guide — available on the defence force’s website — for staff at the Australian Defence Force Academy on working with LGBTI members of the community. As well as the front page story, there is an article on page eight and a full editorial dedicated to the manual. The manual itself includes the “controversial” statements, quoted by the Tele as evidence of “gender wars”, that members should apologise if they accidentally use the wrong pronoun, and that they shouldn’t use pronouns or language that doesn’t match a person’s gender identity. “Defence sources say the guide is part of a politically correct push by Commandant Cheryl Pearce, who wrote in the document that the changes were required to work as a ‘military professional in the 21st century,” Jack Houghton and Miranda Devine wrote. In response to the story, the defence force issued a statement saying cadets weren’t being told they shouldn’t use the terms “him” or “her”, and there was no directive on gender-neutral language — a comment quoted by the Tele. Tele editor Chris Dore told Crikey that the document spoke for itself, and pointed out that Defence’s comment was included in the story published inside the paper. “I don’t know how much you know about the military, but good luck if you take instructions from your superior, in this case the commandant, as a ‘guide’ only,” Dore said. If you see a story you think deserves a coveted Wankley Award, let us know by writing to [email protected]. The Rush case points to a deeper problem and a systemic misunderstanding about the issues that drive complicity in sexual harassment and assault cases. Are the directors of Home and Away going to revolt? Potential (off-screen) drama at Channel 7, NatCon's "ok to be white" moment", plus R. Kelly's "salacious" past. Majestic steeds take over Sydney, a couple of Labor figures spotted at The European and a confusing tweet about the death penalty. Has anyone that has had the pleasure of reading an ADF memo, not had a quiet chuckle about the use (misuse) of the English language purely for the sake of observing military protocols? These are the peoples that call one of those fold-up metal seats a, “One Chairs Nesting”. I think we can all sleep safe tonight. And if Crikey wants to hand-out awards, then give one to the first person that can provide a tangible purpose for the Daily Tele. This does not include, starting a fire, wiping ones arse or providing useful and factual information; I know because I’ve tried those three, and those three don’t work. Have you tried it for lining the floor of a bird cage? I claim my award. The purpose is quite clear – to lie, obfuscate, dissemble and tendentiously mislead those who come within proximity and serve Moloch and his rep. on Earth, the mudorc whilst keeping his minions, the LNP in office.